The paper focuses on Emerging Europe and sheds light on the effects of different types of financing constraints on firm growth – both in terms of sales and employment -, before and after the onset of the global financial crisis. It analyzes and compares a large group of emerging economies, on the one hand (comprising all NMS-10 economies plus Turkey) and the group of economically and financially lagging Western Balkan countries, on the other, and demonstrates that financing constraints significantly obstruct firm growth, with interesting differences across growth indicators, type of financing constraints and economic periods considered. 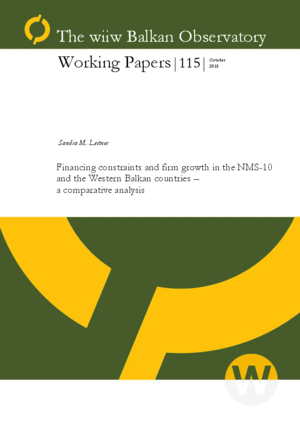 Moreover, it shows that during the pre-crisis period only, financial constraints were more harmful to employment growth of establishments located in the Western Balkans than in the NMS-10. It also highlights that growth is determined by particular establishment characteristics with product innovators or exporters only growing faster while older or larger establishments, importers only or foreign-owned establishments grow more slowly. Finally, it demonstrates that the state of the economy and the particular institutional environment are essential for establishment growth.